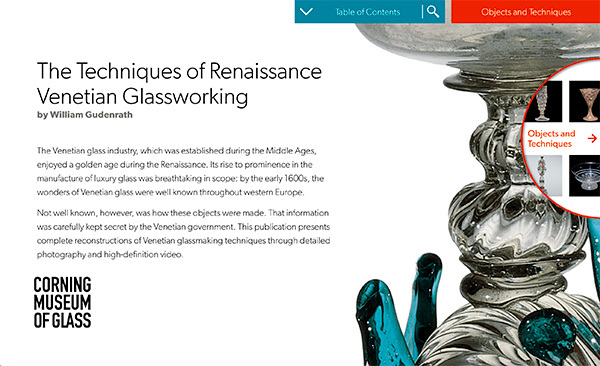 The forms and decorative motifs of Spanish Venetian-style glass are unique, and so is at least one of its construction techniques. A considerable number of objects, including this wineglass, display a very clever invention: the combination of the stem and foot is made from just one additional bubble of glass (Fig. 27). This contrasts sharply with the usual Venetian construction, which unfailingly incorporates two separate bubbles for making the lower portion of goblets. Although the Spanish method is difficult to execute, it saves considerable time and promotes a particularly attractive join between the stem and the foot. Group of Spanish (probably Catalonian) Venetian-style objects: (left to right) goblet, covered goblet (confitero), and goblet, 1575–1699. Tallest: OH. 25.7 cm; Diam. (rim) 8.3 cm, (foot) 8.1 cm. The Corning Museum of Glass (60.3.86; 79.3.283, bequest of Jerome Strauss); 66.3.58, (gift of Jerome Strauss). Photo: The Corning Museum of Glass.